The end of the competitive season begins the start of the off-season. If you were thinking that means relaxation for the skaters, think again. Many are opting to forgo vacations and time off from the ice to begin preparing for the upcoming Olympic season. At the Dr. Pepper StarCenter in Euless, Texas, coaches Peter and Darlene Cain’s elite skaters are busy training for the 2017-18 season. They have already picked their music, worked with choreographers to plan out their programs, and have set their goals high for themselves during the off-season. 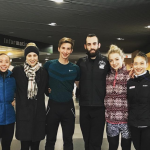 Figure Skaters Online recently caught up with the international squad members of Team Cain. In the first part of our week-long series, 2017 U.S. bronze medalists Ashley Cain and Timothy LeDuc talk about their training preparations for their sophomore season as a pair team. When looking back on this past season, the first word that comes to Timothy LeDuc’s mind is the word “grateful.” As a first year team with his partner, Ashley Cain, LeDuc said there were so many variables that could have happened, but for them to work so well together is what he’s most proud of. “We just really clicked on and off the ice, it is like a really rare find,” said LeDuc. The pair came together almost a year ago at the suggestion of U.S. Figure Skating‘s Senior Director of Athlete High Performance, Mitch Moyer. At the time, Cain was skating singles and LeDuc had just finished a contract skating onboard a cruise ship. After a successful tryout, LeDuc, 27, moved to Texas and announced his partnership with Cain, 21. Cain and LeDuc made their international debut at Nebelhorn Trophy, where they finished just off the podium in fourth place. They followed that up with another fourth place finish in Finlandia Trophy. They earned their first international medal as a team, bronze, at Golden Spin of Zagreb. At their first U.S. Championships as a team, the pair surprised many by winning the short program. Two days later, they earned the bronze medal. Following Nationals, the pair got the opportunity to represent the U.S. at the ISU Four Continents Championships, where they finished in 9th place. When Cain and LeDuc returned home from the event in South Korea, the two had thought their season was over. They said they had already begun thinking of next season, when a few weeks later, U.S. Figure Skating called and told them they would be flying to the World Championships in Helsinki, Finland, in the event that 2015 U.S. Champions Alexa Scimeca Knierim and Chris Knierim were unable to skate. While Cain and LeDuc did not end up competing there, the two had to put on hold their plans for preparing for the new season. When they got back from Helsinki, Cain said they had only been home a day when they received another call from U.S. Figure Skating. This time—they were heading to Tokyo to compete at the World Team Trophy, their first ever team event. Cain and LeDuc returned home with a bronze medal with the rest of their Team USA group. “It was an incredible experience to be standing on the podium with the rest of our team because both of us have never taken part in a team event, so to have that feeling was pretty incredible,” Cain exclaimed. Now with the 2016-17 season officially over, Cain and LeDuc are 100% focused on training for the Olympic season. The two told Figure Skaters Online that they will skate their short program to “I’ll Take Care of You” as covered by Beth Hart and Joe Bonamassa. “The program has a similar feel to our short program from last year (Annie Lennox’s “I Put A Spell on You”). It’s going to be a bluesy, angsty and sensual kind of piece,” LeDuc described. For their free skate, the two revealed they will skate to a medley of songs from the soundtrack of the 2013 movie, The Great Gatsby. The two worked with two choreographers this season. In addition to Serge Onik, who choreographed both their 2016-17 programs, the two brought in Cordero Zuckerman, a former competitive skater with whom LeDuc worked during his stint performing on cruise ships. LeDuc said both Onik and Zuckerman have a modern style of choreography. 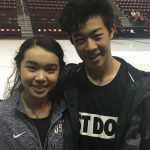 “We chose those two (Zuckerman and Onik) because they have complementary styles and because that is the direction that we want to take our skating. The way we want to brand our team is through classical moves, but with a modern feel. We want to keep things very fresh and new,” LeDuc explained. Cain and LeDuc will participate in the Aerial Figure Skating Challenge (jump competition), June 23 in Colorado Springs, Colorado, and possibly will be debuting their programs at the Philadelphia Summer Championships, July 31-August 6. This season, Cain and LeDuc say everything is going to be new because they have grown as a team. “Our entrances to our throws are different, they are quicker. The lifts are all going to be new pretty much, because we want to try new positions because we are stronger than we were last year. We want to make everything more difficult so we can compete internationally and be competitive,” Cain elaborated. The two say they have also re-tooled the entrance into the lift to make it quicker and they have added the triple flip and triple flip combination into their programs. 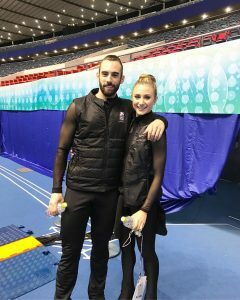 Heading into the Olympic season, Cain and LeDuc are aware of the stakes facing them and all of the U.S. pairs teams, with only one Olympic spot available for South Korea. While making the Olympic team is their number goal this season, Cain and LeDuc say they are also focused on growing and working as a team. Editor’s Note: Stay tuned to part two of our series on Tuesday.